In February 2014 we had 6 synchronised Quintic high-speed cameras installed in Lane 1 of our indoor school, now known as the Quintic Performance Lane (see below). Quintic specialises in premier sports video analysis and the cameras, alongside access to Quintic Biomechanics v26 software, allow us to comprehensively analyse all of our 1st XI, 2nd XI, academy and emerging player programme (EPP) players, in-house. The quick and easy to use nature of the Quintic software has enabled us to complete an injury prevention screening programme for our academy and EPP players during pre-season. The main aim of the programme was to quantify and analyse the hip and shoulder alignment of each bowler during their bowling action, particularly at front foot contact. We were also interested in the alignment of the hips during ball release. 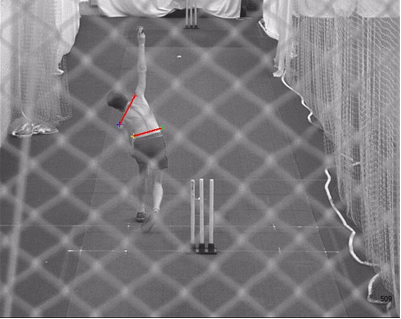 We based our analysis upon biomechanics and injury prevention guidelines provided by the England & Wales Cricket Board (ECB), which dictate that the angle between a bowler’s shoulders and hips shouldn’t be any more than 45° at front foot contact. A further guideline suggests that at ball release, for a right-arm bowler, the left hip should not be higher than the right hip (Figure 2). The six Quintic high-speed cameras were all set to record, in sync, at 120fps. This allowed for accurate data collection to ensure that we could identify exactly what was happening at key points throughout the desired action. For this particular screening programme only the posterior camera was used. The analysis started by identifying the acromion processes of the left and right shoulders for each bowler, as well as the iliac crest on the left and right pelvis. Purpose built reflective markers, supplied by Quintic, were attached to the participant using medical tape and the resultant contrast on the video helps the software to identify and automatically track the shoulder and hip joints more accurately. The bowlers were asked to warm-up and have a few practice deliveries to check that the markers didn’t fall off or move out of position. Six deliveries were then filmed for each bowler, with the instructions to bowl at a normal pace, line and length for a right-handed batsman to gain an accurate representation of their bowling action. 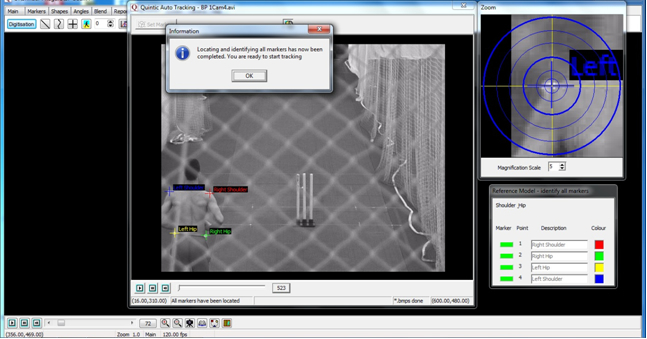 Once recorded, the footage was calibrated and template was added before the Quintic software was used to automatically track the markers throughout the bowlers’ action (See below). 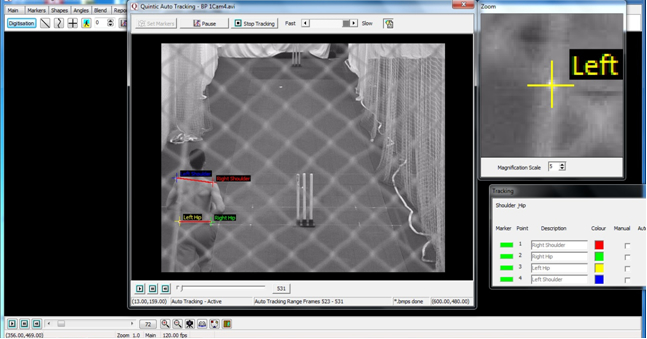 Screen shots were taken of the different phases throughout the bowling action (Take Off, Bound, Back Foot Contact, Front Foot Contact, Ball Release and Follow Through) and a storyboard was produced for each bowler. This provides instant visual feedback to the coaches and players before any data is quantified. From the phases identified, we then focussed on Front Foot Contact (Figure iv) and Ball Release (Figure v). As mentioned previously, our first area of interest was front foot contact. To begin with, lines were drawn to extend the previously digitised traces of the hips and the shoulders. This enabled the hip/shoulder angle to be calculated more precisely. From here it was possible to group the six deliveries from each bowler together in order to calculate the average angle and more importantly the consistency of this angle. Any changes to address technique or prevent injury could be then be put in to place. At ball release we were concerned with the alignment of the hips. For a right arm bowler, the left hip should not be higher than the right hip. From the figure below, you can see that this bowler’s hips are well aligned, with the left hip ready to rise up during the follow through as the bowler propels their body over the front foot. Again, further analysis was completed within the software to determine the consistency of the hip position. 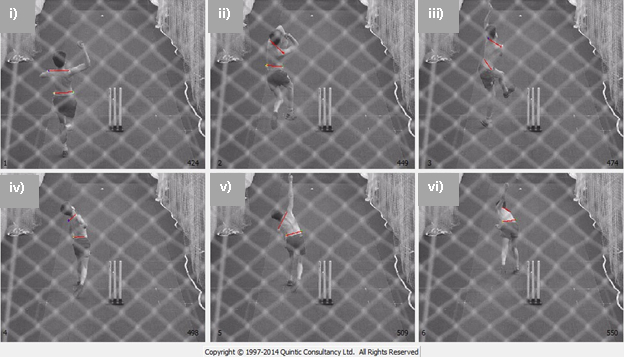 For example, by comparing the hip angle to the horizontal, multiple trials were overlaid on top of one-another to examine the variability of each bowler. This type of basic biomechanical analysis, presented to a coach in the form of a report, is used by the coaches to inform any changes that may need to be made to training or any technical interventions that may be needed. We are also able to undertake similar analysis for various aspects of the game. Ultimately, Quintic allows us to obtain data quickly and effectively which can then be used to measure any issues relating to injury prevention and performance.